This example shows how to maximize the production of an ethylene oxide plant for profit using an economic MPC controller. 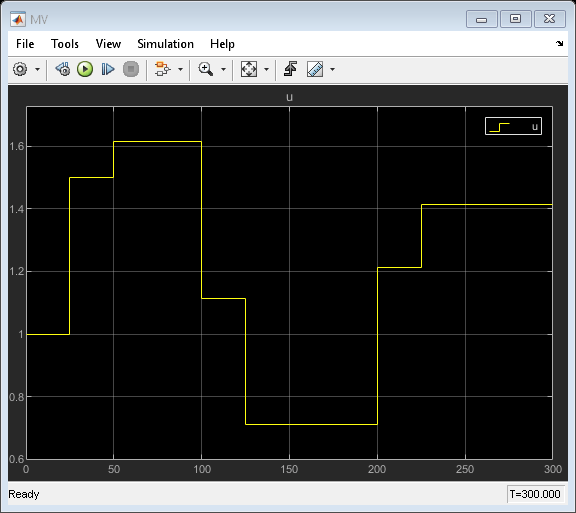 This controller is implemented using a nonlinear MPC controller with a custom performance-based cost function. 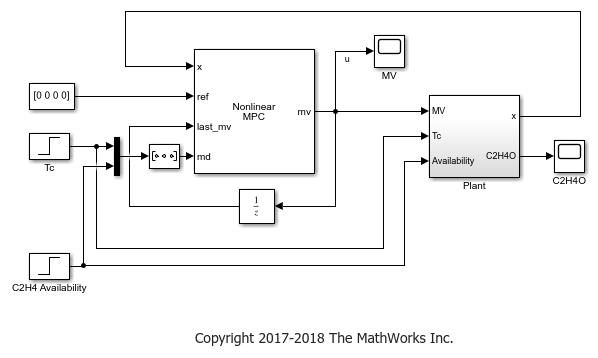 This example requires Simulink® software to simulate nonlinear MPC control of the ethylene oxidation plant in Simulink. The example uses the fsolve command from the Optimization Toolbox™ to find the nominal equilibrium operating point and the fmincon method as the default nonlinear programming solver. 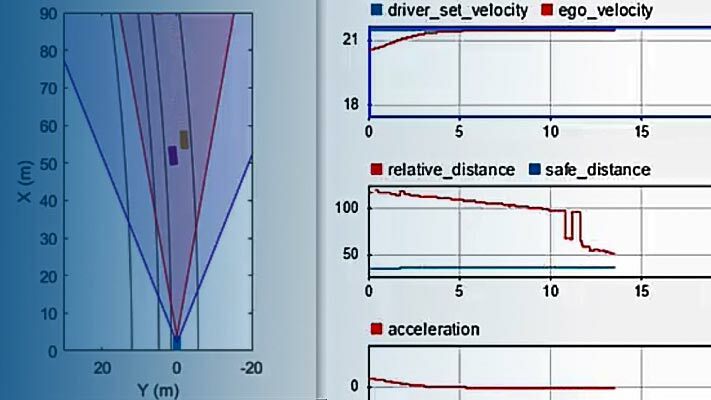 Add example file folder to MATLAB® path. The first reaction is wanted and the other two are unwanted because they reduce C2H4O production. A mixture of air and ethylene is continuously fed into the reactor. The first-principle nonlinear dynamic model of the reactor is implemented as a set of ordinary differential equations (ODEs) in the oxidationPlantCT function. For more information, see oxidationPlantCT.m. All variables in the model are scaled to be dimensionless and of unity order. The basic plant equations and parameters are obtained from  with some changes in input/output definitions and ordering. The plant is asymptotically open-loop stable. The primary control objective is to maximize the ethylene oxide (C2H4O) production rate (which in turn maximizes profit) at any steady-state operating point, given the availability of C2H4 in the feed stream. The C2H4O production rate is defined as the product of the C2H4O concentration in the reactor ( ) and the total volumetric flow rate exiting the reactor ( ). The operating point is effectively determined by the three inputs. is the C2H4 concentration in the feed, which the MPC controller can manipulate. is the cooling jacket temperature, which keeps the temperature stable. is the C2H4 feed rate, which indicates the available ethylene coming from an upstream process. A higher feed rate increases the achievable C2H4O production rate. In this example, both and are measured disturbances. At the initial condition, the cooling jacket temperature is 1.1 and the C2H4 availability is 0.175. 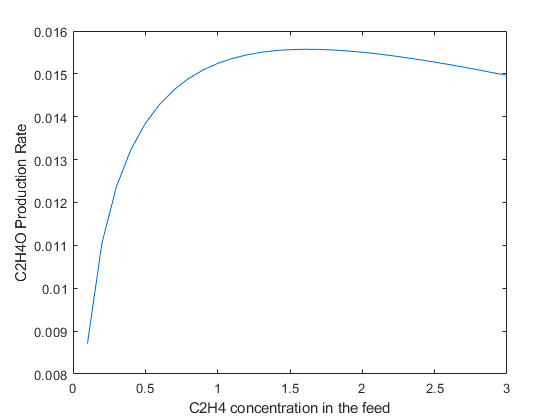 Compute the optimal C2H4O production rate by sweeping through the operating range of the C2H4 concentration in the feed ( ) using fsolve. The optimal C2H4O production rate of 0.0156 is achieved at = 1.6. In other words, if the plant originally operates with a different C2H4 concentration in the feed, you expect the economic MPC controller to bring it to 1.6 such that the optimal C2H4O production rate is achieved. Economic MPC can be implemented with a nonlinear MPC controller. The prediction model has four states and three inputs (one MV and two MDs). In this example, since you do not need an output function, assume y = x. In standard cost function, zero weights are applied by default to one or more OVs because there are fewer MVs than OVs. The nonlinear plant model is defined in oxidationPlantDT. It is a discrete-time model where a multistep explicit Euler method is used for integration. While this example uses a nonlinear plant model, you can also implement economic MPC using linear plant models. In general, to improve computational efficiency, it is best practice to provide an analytical Jacobian function for the prediction model. In this example, you do not provide one because the simulation is fast enough. The relatively large sample time of 25 seconds used here is appropriate when the plant is stable and the primary objective is economic optimization. Prediction horizon is 2, which gives a prediction time is 50 seconds. All the states in the prediction model must be positive based on first principles. Therefore, specify a minimum bound of zero for all states. Plant input must stay within saturation limits between 0.1 and 3. The rates of change of are also limited to +/- 0.02/sec. Instead of using the standard quadratic objective function, a custom cost function is used as the replacement. You want to maximize the C2H4O production rate at the end of the prediction horizon. The negative sign in f is used to maximize production, since the controller minimizes f during optimization. For more information, see oxidationCostFcn.m. Assume that the plant initially operates at u1 = 0.5. Find the states at the steady state using fsolve. The C2H4O production rate is 0.0138, far away from the optimal condition of 0.0156. Validate the state function and cost function at the initial condition. No output function specified. Assuming "y = x" in the prediction model. Analysis of user-provided model, cost, and constraint functions complete. You can compute the first move using the nlmpcmove function. It returns an MV of 1.0, indicating that economic MPC will increase the MV from 0.5 to 1, limited by the MVRate constraint. The cooling jacket temperature is initially 1.1 and remains constant for the first 100 seconds. It then increases to 1.15, and therefore, reduces the optimal C2H4O production rate from 0.0156 to 0.0135. The C2H4 availability is initially 0.175 and remains constant for the first 200 seconds. It then increases to 0.25, and therefore, increases the optimal C2H4O production rate from 0.0135 to 0.0195. The model includes constant (zero) references for the four plant outputs. The Nonlinear MPC Controller block requires these reference signals, but they are ignored in the custom cost function. The Plant subsystem calculates the plant states by integrating the ODEs in oxidationPlantCT.m. Assume all the states are measurable such that you do not need to implement a nonlinear state estimator in this example. The C2H4O plant output is the instantaneous C2H4O production rate, which is used for display purposes. which could be worth millions of dollars per year in large-scale production. In the next 100 seconds, the cooling jacket temperature increases from 1.1 to 1.15. The economic MPC controller moves the plant smoothly to the new optimal condition 0.0135 as expected. In the next 100 seconds, the C2H4 availability increases from 0.175 to 0.25. The economic MPC controller is again able to move the plant the new optimal steady state 0.0195. Remove example file folder from MATLAB path, and close the Simulink model. H. Durand, M. Ellis, P. D. Christofides. "Economic model predictive control designs for input rate-of-change constraint handling and guaranteed economic performance." Computers and Chemical Engineering. Vol. 92,2016, pp 18-36.